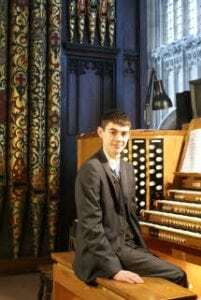 Ben Bloor, Organ Scholar at St George’s Chapel for 2010/2011, has been awarded third place in the American Guild of Organists Regional Competition for Young Organists (AGORCYO). In February 2011, Ben had achieved first place in the European Chapter, which was held in the Temple Church, London. He was one of 10 competitors from the UK and Europe. He also played the hymn ‘Praise To The Lord, The Almighty’. Having won the European section of the competition, Ben travelled to Morristown, NJ, for the Finals, where the other competitors came from Juilliard and Eastman (Yale). The judges made their decision after lengthy discussion and finally awarded Ben 3rd prize with an Honourable Mention. Ben thoroughly enjoyed the competition and his week in the USA – it was his first trip to the States. It was an amazing opportunity for him and he is looking forward to entering another competition in Northern Ireland in August. Ben leaves the College of St George in August 2011 to start at New College, Oxford for a 3 year music course and an Organ Scholarship.